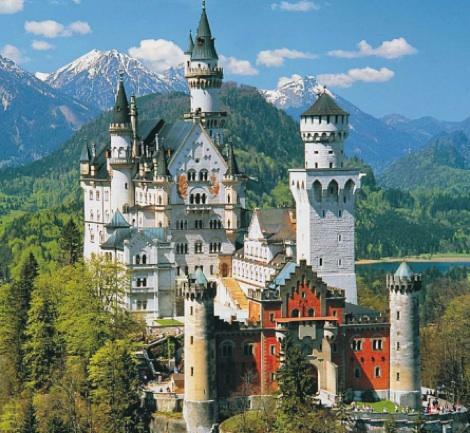 Schloss Neuschwanstein was the ultimate fantasy castle of Mad King Ludwig. It was built between 1869 and 1886 in the Historicist style. It was supposed to resemble a medieval knight’s castle and thus follows the Romanesque style to a large extent. It looks magical, high on a hill against an Alpine background. The briefest of glances tells you where Disney’s castle came from. Schloss Neuschwanstein's interior, which can only be seen on a guided tour, mostly resembles scenes from Wagnerian operas such as Tannhäuser and Lohengrin. The Singers’ Hall is a smaller copy of the one in the Wartburg near Eisenach and its walls are decorated with scenes from Parzival. Only about 20 rooms are on view, as the castle was never completed. King Ludwig spent less than six months here. Several routes lead to the top of the hill where Schloss Neuschwanstein is perched. The most interesting route goes up through the Pöllatschlucht (Pöllat Gorge) to the castle. Others go more directly and are less strenuous. Walking up requires 20 to 45 minutes, depending on the route chosen. It is also possible to take a minibus or horse-drawn carriage to the castle at the top. Submitted by ItalianGypsy on Mon, 12/06/2010 - 03:35. This is the one to see, people! This is the one to see! But be prepared for long lines. We were there in August and had to wait and wait to get in. A pretty cool tour though, and well worth the wait! Submitted by pinkgecko on Thu, 12/02/2010 - 16:06.